From Mount Barker - take Wellington Road following the signs to Strathalbyn. At Wistow, make a right turn to Strathalbyn. Follow the road and take the second right turn sign posted Archer Hill Rd. We are two kilometers along Archer Rd on the,left hand side. Are you looking for an accommodation in the heart of a rural area? Are you looking for peace and tranquility, with the ability to explore our 18 acres of land, be among the animals and maybe a quiet bush walk? 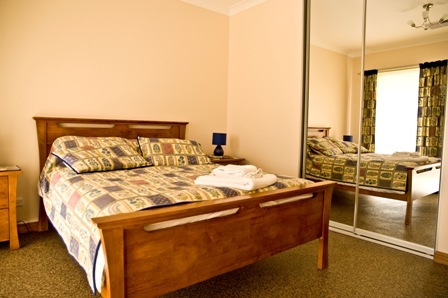 Our guest accommodation is private, with your own entrance and facilities whilst giving you the opportunity to interact with the owners if you choose. A full cooked breakfast can be prepared for you as part of our tarrif. A light continental breakfast is supplied for all bookings. Our rates are discounted for longer stays, simply refresh your search requirements to access lower rates. Come and stay in a private part of our beautiful new home, set on 18 rural acres just outside Mount Barker. Enjoy the facilities of home with your own space and freedom to explore. Only ten minutes from the heart of Mount Barker, and a further five minutes from either Hahndorf or Strathalbyn this is the perfect getwaway for you. Our master bedroom has a very comfortable queen size bed with direct access to the outside courtyard area. The second bedroom has a comfy double bed. Panel heaters are in each bedroom along with our reverse cycle ducted heating and cooling. Our guests have a private lounge, modern bathroom and laundry with small kitchenette. Private alfresco area. Full breakfast is included in the tarrif. Our guests have a private lounge, modern bathroom and laundry with small kitchenette. Breakfast is not included in the tarrif. Coffee/tea and toast is provided.